Who would have thought that we would be here nearly twenty years since Unbreakable, with the final film in the “Eastrail 177 Trilogy.” Glass brings our characters from Unbreakable and Split together for the first time in M. Knight Shyamalan’s latest film. Following the events in Split, by a few days/weeks, The Horde (James McAvoy) continue their reign of terror with the kidnapping of four teenage girls. Hot on his trail is our “avenger” David Dunn (Bruce Willis), with his 30-year old son in tow, as his faithful “Robin” – computer expert and logistical support watching his back. After confronting The Horde – the police intervene and capture both men essentially ending The Horde’s reign of terror and putting a stop to Dunn’s “vigilante” endeavors. Both men are remanded to the custody of Dr. Ellie Staple (Sarah Paulson) and placed in a mental asylum. Not only does the hospital serve to keep a keen eye on the group but it also houses a very special guest: Elija Price aka Mr. Glass (Samuel L. Jackson). With all three men under arrest and set to spend a long time under Staple’s care – she will try and understand what it is that makes them unique. Her focus in life is the treatment of people who believe that they are superheroes. One thing I just noticed is that my review has a lot of quotation marks. Yeah, that’s me trying to be purposefully obtuse in my observations of our characters and their roles. 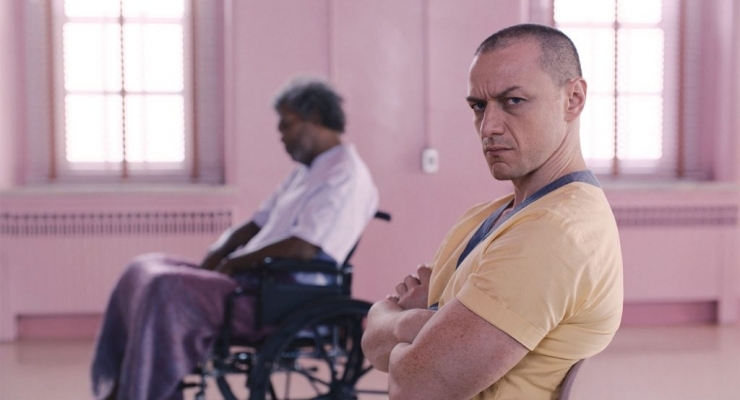 Make no mistake, Glass is a comic film if its heroes and villains lived in the real world. These beings with extraordinary people with gifts are grounded in the real world. You will not see folks shoot laser beams from their eyes or project energy bursts from their bodies. That’s not how this world is set up. In fact, if you’ve been keeping track, the rules were established almost twenty years ago in Unbreakable. Split followed these rules, as well, before coming full circle in Glass. Samuel L. Jackson and James McAvoy in Glass (2019). © 2019 Universal Pictures. All Rights Reserved. Unbreakable was one of the best films of 2000 and in my opinion, established the sub-genre of the independent superhero genre. That television show Heroes, I believe, was directly influenced by M. Knight Shyamalan and Unbreakable. Split, was a more hidden film, until the end, which built up the buzz tremendously for Glass. I enjoyed Glass a lot, with exception to the final 3-5 minutes of the film. This may just be due to needing some further clarification on a few things. The film does tend to let itself breathe – it’ s a psychological tale as opposed to an action film. How some people are saying that this film has no action is quite mystifying since none of the films in this trilogy ever had big action set-pieces. Folks should go and re-watch Unbreakable and Split and see how much action there was in those two films. People seem to forget that these are grounded-in-reality-films. I will be seeing Glass again in theaters, so my initial rating may go up after a second viewing. I think all three actors continue to show their qualities embodying these characters and it’s pretty cool to see Bruce Willis on the big screen again – he’s been busy doing these DTV films that no one will ever see, so it was nice to see him on a big release and on the big screen for change. James McAvoy continues to rock as The Horde and Samuel L. Jackson is truly sinister as Mr. Glass. Glass is recommended. 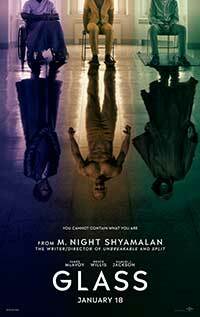 In his the last entry in his off-kilter superhero trilogy, M. Night Shyamalan gives Glass, story of a security guard with supernatural powers who tracks a disturbed villain with multiple personalities. Glass is a fitting end to this trilogy of non-traditional heroes/villains living in the real world. I think M. Night Shyamalan has risen from his filmmaking slump with his last three films (The Visit, Split, Glass) and I am curious as to what he will have in store for us next.